One of the great advantages of working from home is the relaxed atmosphere that comes with having an office down the hall from your bedroom. Being able to roll out of bed, stroll down the hall, and start working in my pajamas is probably the best part of being an independent creative. Of course, one of the biggest disadvantages of working from home is the relaxed atmosphere that comes with having an office down the hall from your bedroom. Being able to roll out of bed, stroll down the hall, and start working in my pajamas is probably the most challenging part of being an independent creative. I don’t have a procrastination problem. Well, I used to think that I did, but in reality, I wasn’t putting off work that I didn’t want to do, I just had too many distractions that kept me from getting that work done. I call it distractionation. It’s a very fine line, and probably a needlessly semantic argument, but to me, the difference is crystal clear. It’s not like working on my website and designing business cards isn’t something that I’m avoiding doing, it’s just that with Facebook, and YouTube, and Wikipedia just a browser click away, it’s easy to lose an hour watching cats play the piano, when I originally jumped online to do some research. Can you find what I was working on? Me either. This is the inherent evil of the Internet-I started out looking for cardstock for my business cards. 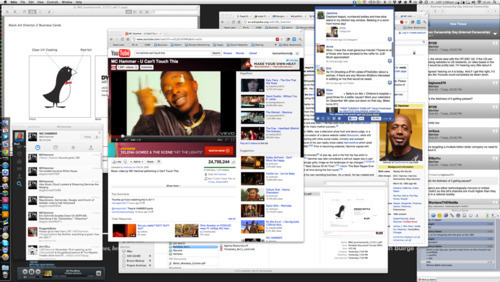 But before I did that, I went looking for music to listen to on Rdio while I worked, which led me to watching 90’s rap videos on YouTube, which led me to looking up MC Hammer on Wikipedia, which led me to finding his Twitter account (@MCHammer, in case you were wondering). Add to this the constant pinging alert noises of my email and my instant messenger. And let’s not forget the pinging of my iPhone and iPad next to me letting me know when someone has messaged me on Twitter or Facebook. Two hours later, I found myself nowhere closer to finishing my task, and frustrated as all hell. I didn’t start out with the plan to watch MC Hammer videos for an hour, it just happened. And I’m sure it’s happened to you too-those 24 million views of “U Can’t Touch This” came from somewhere, and I’d bet the majority of them came during working hours. I realized at that moment, I needed to change my workspace before I could change my behavior. First, I ditched the Facebook notification in the taskbar. I love you Facebook, but there’s literally nothing on that site that requires my immediate attention, and if it did, whoever needed my immediate attention has my phone number. Secondly, I moved my Google Chrome browser to a different Space. One of the great things about OSX Lion is it’s ability to manage virtual workspaces-I have my email in its own space, as well as iTunes and iCal. It’s all only one swipe away if I need it, and isn’t in my line of sight all day. It’s the perfect location for the timesink that is the Internet. Out of sight, (hopefully) out of mind. Next, I killed the audio notificiations on my mail client and instant messenger. I also turned off the visual mail indicator on Mail.app. Again, when it comes to these two, there’s little that needs my immediate attention. I need to stop being tethered to my email, because more often than not, it’s what starts my path down Internet distraction. My plan going forward is to check my mail once an hour-that’s it. 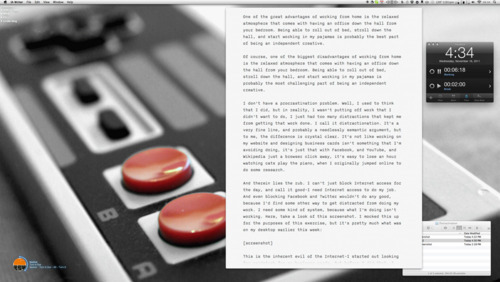 Then I picked up two apps: Awaken and BreakTime, both available in the Mac App Store. A while back, I tried, with some success, Merlin Mann’s procrastination hack, ‘(10+2)*5’. In a nutshell, you take a timer (Awake, in this case), and set it up so that you work for ten minutes uninterrupted, and then take a mandatory two minute break to do whatever you want. The key here, is to make sure you take the two minute breaks. The “hack” is, eventually you start working through the breaks (I’m typing this during one of my “breaks” right now). I added BreakTime to the mix, because it locks down your screen after an hour, to make sure I get up and take a ten-minute break from my desk. I love my iMac, but I probably shouldn’t spend more time with it than I do my wife. Knowing that I’m allowing myself to be distracted and play every ten minutes, makes those ten minutes go especially fast. Now, instead of spending hours trapped in a Wikipedia hole, I’m taking an authorized ten minute “goof off” break every hour, as well as a ten-minute break every hour to get away from my desk altogether. I also cleared a bunch of the needless clutter from my taskbar-anything that didn’t need to be there, or anything that was likely to start flashing and distract me from my task at hand, was gone. I realized that the music I listen to also affects my work. For example, when I’m writing, I need mellow, soulful music, so I can process my thoughts instead of trying to hear lyrics. When I’m designing, I put on more faster paced, harder music. Right now, I’m listening to jazz trio Soulive. When I’m done here, and get back to my website concepts, I’ll throw on Childish Gambino’s new album. Before, I’d listen to whatever was on Rdio or iTunes, or worse-I’d had a TV show from my iTunes library playing in the corner. None of that was doing me any favors. Lastly, I cleaned off my desktop. Like most creatives, when I get in the heat of the Internet, I drag a lot of stuff to my desktop, whether it’s research, screenshots or funny cat pictures. They sit there, unused, clogging up system resources for weeks. I trashed the ones that were useless, and filed away the things I needed later. The only thing that remains is my other desktop: the one this iMac is currently sitting on. It’s a mess. On my left, there’s a stack of papers and books to be filed away, and on my right, there’s a growing stack of empty beer cans juice boxes that need to be recyled. As the open space on my desk gets smaller and smaller, the more likely I am to get distracted by something on it grows. So that’s the next task. I’m also going to add a notepad to my desk-anytime I think of something I need to Google right this instant while I’m in my work period, I’m going to write it down and save it for my break. Free of clutter, and free of distractions. Everything that I used to let distract me is on another Space, ready and waiting for my two-minute break, or lunchtime. Now I can focus on the most important task at hand, which is growing this business so that the reality matches what is bouncing around in my head. Do you struggle with distractionation? How do you manage it? Leave your answers in the comments below.